The encounter began after the militants opened fire on the security forces' personnel on patrol duty in Lolab valley. SRI NAGAR: Two Hizbul Mujahideen (HM) terrorists were killed in an encounter on Thursday after they fired upon security forces in the Kupwara district of Jammu and Kashmir, police said. An INSAS rifle, snatched earlier this week from a policeman in the region, was recovered from the terrorists, said a police spokesperson.The deceased militants were identified as as Bilal Ahmad Shah and Zahoor Ahmad, both locals, he added. According to a police official, after receiving inputs about the movement of militants in the area, the army and CRPF men had established a check point in Khumriyal of Lolab on Thursday afternoon.“While the vehicles were being checked at the check point, militants fired at the security force personnel. The troops returned the fire, triggering an encounter,” he said. In the ensuing gunfight, which continued for about an hour, two Hizbul Mujahideen militants were killed. “They were affiliated to the proscribed terror outfit HM. 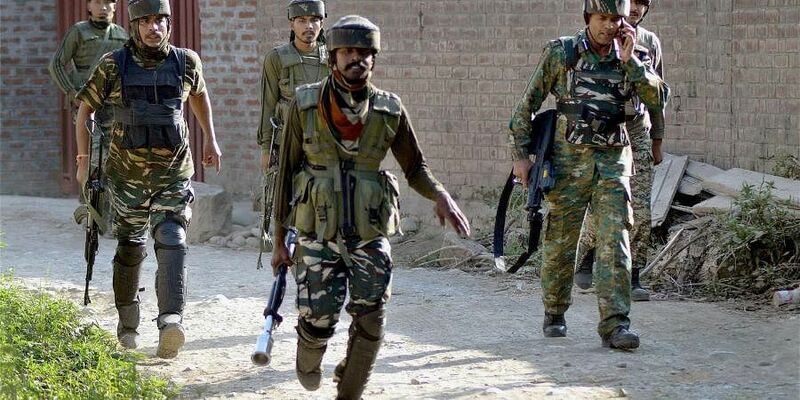 Both the terrorists were involved in several attacks on security establishments and civilian atrocities in the area,” the spokesman said.They were also involved in weapon snatching from a policeman in Kandhar area of Kupwara on July 31, he added. “Besides, an AK-47 rifle and some ammunition were also recovered from their possession,” he added. After the weapon snatching incident, first such incident in Kupwara, security forces had launched a massive manhunt to track down the militants.Meanwhile, militants snatched a rifle from a bank security guard in south Kashmir’s Anantnag district on Thursday. A police official said militants barged into Jammu and Kashmir Bank’s branch at Brakpora in South Anantnag district and overpowered a bank security guard deployed there.“The militants decamped with a 12-bore rifle of security guard,” he said. Immediately after the incident, police and army officials rushed to the spot to take stock of the situation. On July 27, militants had also snatched a rifle from a security guard at the Jammu and Kashmir Bank branch in Shopian town in south Kashmir. Unidentified militants snatched a rifle from a bank guard in Anantnag district of Jammu and Kashmir, police said. The militants appeared at the Jammu and Kashmir Bank’s branch at Brakpora in south Kashmir’s Anantnag district, they said. A police official said the ultras took away a 12-Bore rifle from the guard.